The Myth of Stuff: A Wannabe Minimalist Homeschooler’s Perspective – Homeschooling in the "D"
When it comes to homeschooling, there seems to be an overwhelming idea that more is better, After all, you are the school and you need tons of resources to provide an environment capable of meeting the needs of your little scholars, right? 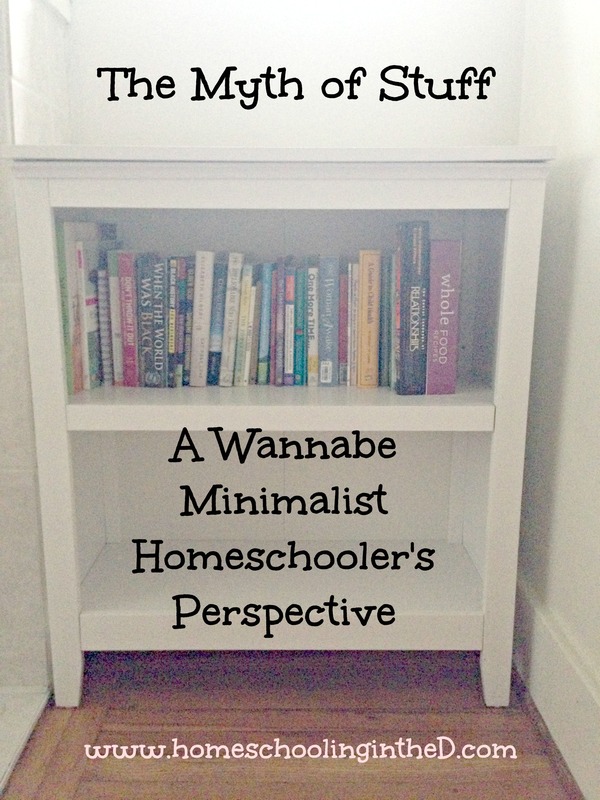 As a new homeschooler (and even as a veteran), you read blogs and watch YouTube videos of other homeschoolers and the majority have dedicated spaces, even whole rooms, exclusively for homeschooling and its supplies. In these spaces you see tons upon tons of shelves, boxes, and binders full of traditional school supplies (e.g., crayons, pencils, paper, notebooks), textbooks/curriculum sources, readers and other books and educational kits and projects for the kids, books and resources for the parents, and so on. You see thrifty and creative homeschool mama’s shopping hauls where they proudly display even more of the supplies they buy to enhance the educational opportunities for their children. And then there are the virtual homeschooling spaces. Oh boy. Between blogs, YouTube, Pinterest, Facebook groups… you name it, there are a ba-zillion ways to store information digitally. Will you be able to find it when you need it later? That’s the question! Overall, if you’re a homeschooler or you’re looking into becoming one, resources are not an issue. In fact, the opposite is true. As a newbie, I fell into the trap of following what seems to be the traditional way of thinking when it comes to homeschooling — the more, the merrier. Over these two years, I’ve bought loads of, I’m just going to call it stuff, to help me teach and inspire my kids and, I have to be honest, I haven’t used the majority of it. Do you know why? I didn’t have a real plan for the items before I purchased them. I thought we needed to have most things just in case because, you know, all the successful homeschoolers had them. I threw my regular ‘less is more’ thinking to the wind and my “oohhh! This is so cool! I gotta have it!” homeschooling mama brain took over. What the latter left me with are oodles of resources that just sit there because I was impulsive and didn’t know what I didn’t know. You know? When you begin homeschooling, regardless of how prepared you think you are, you’re going to have to find what works for your family, and that means that you may or may not need to buy a lot of stuff. If I could do it over again I’d make more of an effort to sit on making a decision to buy something (even for accepting freebies!) to grow in a way that honored me and my family’s overall goal of intentional, passion-filled living. For us, that would mean wayyyyy less homeschooling stuff. Those are just some examples of moving away from the stuff that still provides loads of educational opportunities, but doesn’t leave me with the task of managing the items and possible buyer’s remorse. Personally, I will be pairing down our homeschool supplies (blog post(s) to come!) and limiting future ones, both physically and digitally, because I can see how having more than we need is wasteful for my family. Every family has to find their own way and sometimes that means having more homeschool items at home. That’s OK. However for my family, I’m putting my ‘less is more’ cap back on from now on. More life, less stuff. That’s where I want us to be. This is great advice! This is our 2nd year of homeschooling and I have to say that all the “stuff” is very overwhelming but I also felt that I “needed” it to be successful. I have also found that most of it just sits and is never really used. I agree. We have home schooled with curriculum for about four years. I limit our book purchases too because many books aren’t reread. I buy the books that we checkout often. We appreciate the library:) I do review curriculum, but I get rid of stuff several times throughout the year. Less is more. Looking forward to your future posts.